Scooper - Technology News: Could this be the answer to the growing infrastructure gap? There’s a growing gap in the financing of infrastructure, and it’s likely to put additional pressure on the global financial system. In fact, just keeping up with the current pace of global GDP growth will require $57 trillion of infrastructure investment between now and 2030. Almost everyone would agree on the importance of investing in infrastructure – it’s the basic physical system that holds together our countries and allows them to thrive. 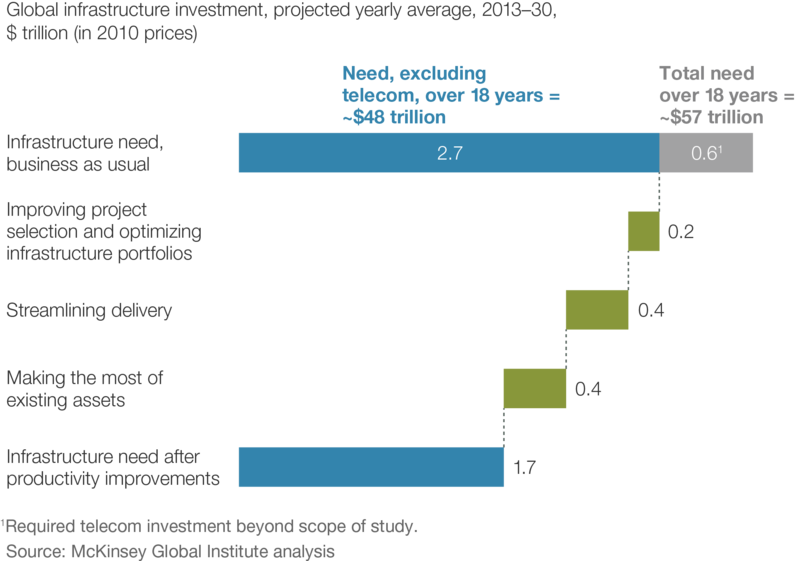 In fact, McKinsey estimate improved infrastructure productivity could save $1 trillion a year. But not everyone can agree on how to bridge this financing gap. Is there a solution? At the B20 energy Forum last October, experts had a recommendation on how to start bridging the gap: social credits. Social credits are a positive externality aiming to bridge the gap between the available private capital and the massive need for sustainable economic growth and infrastructure projects. Basically, social credits offer an incentive mechanism to attract private capital for critical projects. And looking at the data, it’s clear that an incentive is needed: according to research, the annual infrastructure shortfall in public spending is over $1 trillion. Since these projections don’t include increased demand for global spending in areas such as education, healthcare and other public or social sectors, we’re clearly looking at an unprecedented level of pressure on public expenditure globally. This can only be eased with an effective strategy for utilizing private capital, which is currently estimated to be in excess of $150 trillion. It is also growing consistently and is constantly looking for new investment opportunities. Interestingly, a recent survey of high net-worth individuals under the age of 45 found they were particularly keen to invest in projects that have a deeper social impact. Could social credits encourage the holders of this wealth to invest it in public infrastructure projects? First, let’s go back to basics: what exactly are social credits? It’s a system under which those investors looking to make impactful investments are issued a specified number of social credits that can be redeemed in a number of ways that could contribute to economic growth. For instance, social credits could be used to capitalize a new company that might create new jobs, or for a company to issue new shares, or for a donation to a qualified non-profit entity and to offset a tax liability. At a more advanced stage, social credits could also be tradable at a social impact marketplace, or they could potentially be used as a digital currency. Clearly, a number of safeguards and precautions would need to be in place to avoid any unanticipated effect on the public finance structure of the countries involved. Social credits would therefore need to have, for example, a clear expiry date for redemption. There should be minimum and maximum redemption thresholds and ceilings within each fiscal year. Redemption could be linked to impact assessment and could be phased out in line with public-private partnership models used for social credits-approved investments. Such measures (and potentially others) would be necessary to allow each involved country to be able to predict and plan the use of social credits in coordination with their fiscal and financial policies as well as investment strategies. If social credits sound like such a good idea, how do we get things moving? A pilot between two countries would be the best place to start. The chosen countries should have similar legal systems, and reasonably sized trade and investment inflows. A pilot between the UK and South Africa could work well. The UK has a longstanding tradition of using innovative strategies in development finance, so would be in a good position to offer further guidance on implementing social credits. South Africa not only has a similar legal framework to that of the UK, but has also expressed an interest in sustainable economic growth. The existing trade and investment relations between the UK and South Africa further confirm their suitability for the pilot. Once both the proposed pilot countries agreed to take part in the project, they could work together to come to a broader agreement on how this might work in practice. This could be under their existing double-taxation arrangement or separately in the form of an MOU. As a first step, the pilot countries could discuss and agree on an incentive structure, and classify sustainable economic growth as an FDI-approved sector. More specifically, the pilot countries could earmark certain sectors, such as agriculture, water and housing (or basic needs), education, health, energy and financial services (or basic services), and climate-change (clean energy and related projects) as the eligible sectors to pilot social credits. We don’t yet know whether social credits could be the answer to our growing infrastructure financing gap. But we do know that the stakes are too high not to at least try. It concerns our roads, our schools, our houses, our energy sectors. In short, our future.